John King to Dems: Is ObamaCare Important Enough to Buy Votes? To get Senator [Mary] Landrieu's vote, just to proceed, just to go across the starting line, language was inserted in the bill that gives her state up to $300 million. To get Senator [Ben] Nelson's vote, [Senate Majority Leader Harry Reid] agreed to drop a request that you take away the antitrust exemptions for insurance companies...[Is healthcare reform] important enough to buy votes? This marvelous question was asked on Sunday's "State of the Union." In attendance were Democrat Senators Sherrod Brown of Ohio, Michael Bennet of Colorado, and Jeanne Shaheen of New Hampshire. 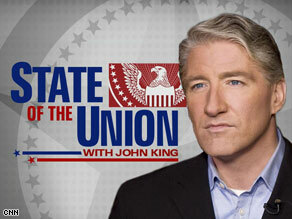 JOHN KING, HOST: Well, let me talk to you about the process a little bit. If you look at the front page of The Washington Post today, "Sweeteners for the South." To get Senator Landrieu's vote, just to proceed, just to go across the starting line, language was inserted in the bill that gives her state up to $300 million. To get Senator Nelson's vote, the leader agreed to drop a request that you take away the antitrust exemptions for insurance companies. This got us to day one of the debate. Is this the way to do things? The central promise of the Obama campaign was to change the way Washington works. That's Washington as usual, is it not? KING: But is it important enough to buy votes? BROWN: I don't say it that way. I think there are a lot of things that we all go to the leader and talk about things in our state. And news reports sometimes aren't accurate about what might have been done for somebody or what might not have been done for somebody. I want to see this bill pass. Nobody likes these kinds of -- any kinds of deals. I think anything that's done needs to be in the best -- in the best interest of those states and this country. I think those probably helped, if that, in fact, really happened -- I have no way of really knowing if it did. I suppose that helped a lot of people in Louisiana that don't have insurance, and so I think we move forward. We do what we need to do, within ethical bounds. We do what we need to do within practical bounds. Keeping this, as we've all said, keeping this bill, keeping the costs down and keeping this bill budget-neutral or better, as Jeanne points out. KING: Does it make it harder to do that? Does it create a climate if you're on the fence, legitimately on the fence, you think, all right, well, maybe I want to be a good Democrat and swallow my pride or swallow an issue or two and vote for this in the end, but I'm going to get something for it, and that's going to cost money? SENATOR JEANNE SHAHEEN, (D-N.H.): Listen, in the end, this is going to be a compromise. It's not going to be a perfect bill, but it's going to be a very important starting point. And I think it's important to point out that this bill is not just about how do we deliver health care in a way that is more cost-effective, because families can't afford it anymore, business can't afford it anymore, and the economy can't afford it. But it's also about how do we do it in a way that improves people's health and their lives. And, unfortunately, we're spending more money right now on health care in this country than any other industrialized nation. And yet, we're not healthier. And so we've got to change the way we do things. And that's what this legislation is about. Readers are reminded that Sen. Mary Landrieu (D-La.) claimed Saturday "very partisan Republican bloggers" were making the case that she voted for cloture as a result of the provision added to the bill giving her state additional healthcare funds. I guess we can now add John King to the list of "very partisan Republican bloggers," correct Senator?